Commercial Power Supply – American Independent Power, LLC. Take control of your power needs! AIP/NCC is offering specifically sized systems for both grid-tie and off-grid applications commercially. CSPVMD systems can be placed in a variety of locations and service scenarios. From manufacturing to retail store applications, CSPVMD can greatly reduce the load on the local utility grid and provide secure, uninterrupted electric power long term. This unit is housed in an 8’ x 8’ x 8’ cargo Conex container. It has an output of 12kW, 54 continuous amps, and can accommodate a designed max load of 113kWh/day. (1) 8’ x 8’ x 8’ Conex container. (20) 400Ah deep cycle batteries. (2) Midnight 150 classic charge controllers. (1) HC-65 LED overhead light. (1) 240VAC / 100 Amp external service panel (for connection to the host service panel). Stated weight does not include panels or racking – this is the containerized system only. Twenty four solar panels in (2) 12 panel arrays supply daily charge requirements to both battery banks. 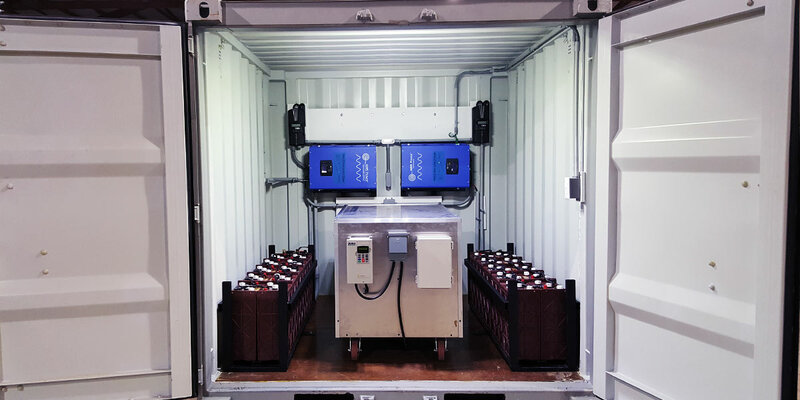 The 12kW Inverter on the left is the primary supply to the host site at 240VAC as supplied directly from the left battery bank (10 batteries in series- parallel, for 48VDC output). The 12kW Inverter on the right supplies 240VAC to Mag-Drive, which has a timer set to supply charge to the left battery bank at night (10 batteries in series- parallel, for 48VDC output). 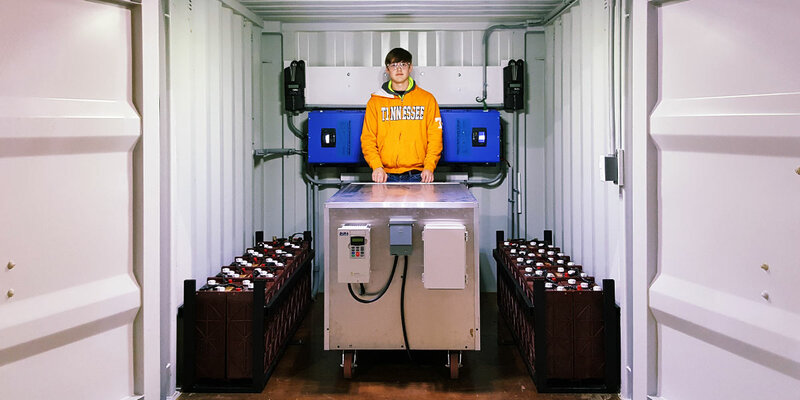 The 12kW inverter on the right is also tied to the input of the 12kW inverter on the left as backup in the event that the host load exceeds capacity of the battery bank on the left. In that event, the onboard transfer switch in the 12kW inverter on the right switches to the inverter on the left, which is supplied by the battery bank on the left. NOTE: All off-grid systems should be monitored for max load per day in conjunction with weather conditions. Daily supply is calculated on six hours of sun during any given day. Protracted inclement weather (overcast/rain/snow) affects the performance and subsequent charge rate. Monitoring the hourly load is important. Not adding load without calculating the Ah effect has risk of battery depletion for the day. Additionally, extended inclement weather events (two or more days) should result in managed energy consumption by host. Only critical systems should be operated for that period. Should the host require additional energy for increased loads over time, additional batteries and panels may be added. Consult your CSPVMD dealer for details. Nathan Woodard, a mechanical engineering student and employee, stands in the center of the assembly for scale. Nathan made substantial contributions to the construction of this unit. American Independent Power, LLC © 2014. All Rights Reserved.